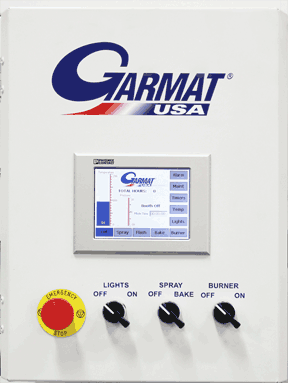 Control of your paint booth is at your fingertips with Garmat® USA’s Touchscreen Controls. Includes all the functions you need to run your operations efficiently. Upgrade to WiFi connectivity and operate or monitor paint booth operations from your smartphone, tablet or PC. Garmat’s Touchscreen is standard on select models of Garmat Mechanicals. When in the spray mode and the spray gun is not activated, the Energy Conservation Unit is an option for the booth that recycles 80% of the heated air in the booth, (100% in CTOF) dramatically reducing energy costs. Once the spray gun is reactivated, the booth returns to normal spray mode. Our Interactive Panel gives you control of the booth with a touch of the screen. Simple and easy to read menus pop-up offering further information and control. The touch screen allows you to maintain ideal pressures for spraying and curing cycles utilizing only the amount of energy necessary.